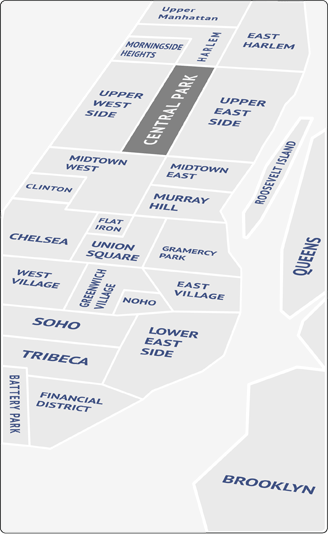 TriBeCa (which stands for Triangle-Below-Canal) extends south of Canal Street, down to Barclay Street, between Broadway and the Hudson River. Populated mostly by professionals working in the Financial District, TriBeCa is home to an impressive number of high-end restaurants and chic clubs. Robert DeNiro, perhaps its most famous resident, runs his Tribeca Productions film company from the heart of the neighborhood. Like its northern neighbor SoHo, TriBeCa is no stranger to art galleries and upscale clothing boutiques. A beautiful, wealthy neighborhood, with fewer crowds than some of the surrounding areas. TriBeCa is known for its spacious loft apartments, housed in buildings once used for light manufacturing and warehousing. Over the last twenty years, most of these industrial buildings have been renovated and transformed into luxury rentals and condos. Some of the best-known restaurants in New York are in TriBeCa. Nobu, Montrachet, Bouley and Chanterelle: the neighborhood eateries draw crowds from all over the world. But lest you think that every joint in the area is a wallet-buster, fear not – there are plenty of casual dining options as well. Like its restaurants and stores, Tribeca’s bars draw a chic, upscale crowd. This is where the city’s movers and shakers come to relax. If it’s more refined entertainment you want, the area has a respectable number of off-Broadway playhouses, the Tribeca Performing Arts Center, and the ever more popular annual Tribeca Film Festival. While it may not have a major park, TriBeCa boasts a good stretch of waterfront, including an exercise path that attracts runners, bikers and dog walkers in equal measure. Many of the residential buildings in TriBeCa qualify for post-9/11 rent relief, so expect this neighborhood to continue growing.